Home Shunga Collector's Corner Are You Interested in Joining the Shunga Community? Through the years we have got a lot of requests from clients and visitors to evaluate their shunga. I seldomly reply because it takes too much time. But this time I made an exception because I want to test if their is any interest among fans to join a shunga community (please look at the end of this post for more info!). Several years ago I was given a Japanese shunga art as a gift. I didn’t receive any information about the work at the time, and was hoping to get some information about the artist, and also about the market value. I have enclosed some images. Please let me know what you think. All the best, Mark D.
Thanks for your interest Mark. Normally I don’t offer valuations because it takes too much time. We are thinking about starting a forum community for shunga fans and collectors in 2018 to give them the opportunity to add questions/inquiries like this. The design features a courtesan making love to a client on the top floor of a brothel. An amusing detail are the three kids playing a middle-sized chū-daiko (Japanese drum) depicted on the painting in the background. 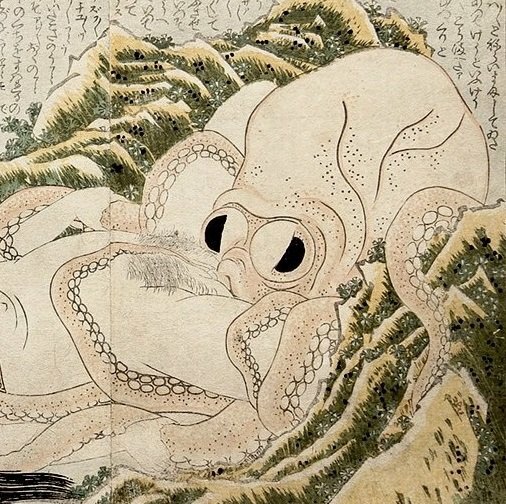 The print is from the 1840 period and designed by a member of the Utagawa school (possibly Koikawa Shozan). The print is a pretty common design and has some conditional problems such as loss of paper due to the use of aggressive metallic pigments and the colors (especially the left panel) are pretty faded. I am personally not interested in obtaining it but the value is approx. Euro 135 – Euro 185. 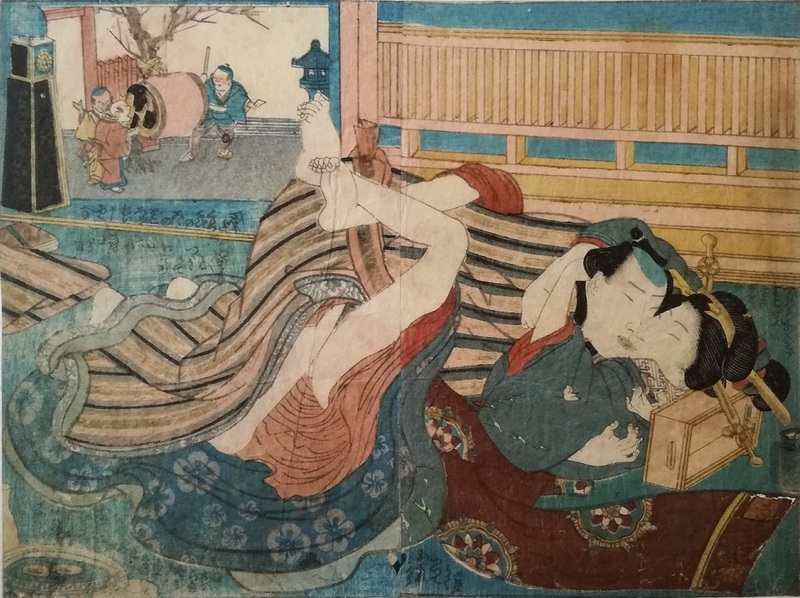 Would you (the reader of this post) be interested in joining a shunga community to share your knowledge, tell your story, ask questions, inquiries, tell about your collection…etc., if it was available? If so, please let me know in the comment box below or through e-mail. If there’s a lot of feedback there’s a big change I will start such a “hangout”..!!! Thanks Nilou, I have added you to our list and you will be updated on all of our future activities..! !